I was watching the bees fly the other day, and musing on just how they manage flight (this was before the current snow storm, of course). The bees have huge bodies with tiny wings, and an ability to fly fast while they brilliantly navigate our complex world. So I went and did a bit of research. Can you tell I’m done working the bees for the winter? (A short note: I work on an older computer, which doesn’t really communicate with wordpress very well any more. For image links, please click on the links in the captions – not the pictures). About 80 years ago, French entomologist August Magnan said it should be impossible for bees to fly. Bees were considered too heavy for their tiny wings to loft them into the air. It was just areodynamically all wrong. By the the mid-1900’s researchers had delved a bit more into bee flight, looking at both muscles and wing beats, accoriding to “The Biology of the Honey Bee”, Mark L. Winston. 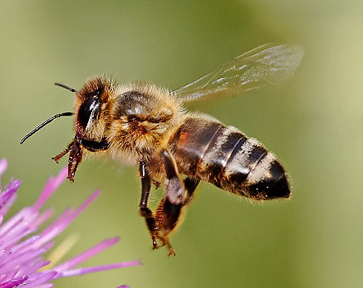 Bees have two sets of flight muscles: the longitudinal and the vertical. As you might guesss the Longitudinal go cross-wise across the thorax, between the wings. The Verticals go the length of the thorax. Contract the longitudinals, the verticals get longer and wings go down. Studies between 1960 and 1980’s also showed that bees were flapping their wings really fast: more than 200 times a second. Alshuler discovered that for bees to hover in one place, bees beat their wings 230 times a second, When bees fly faster they still beat their wings at this rate, but the stroke of their beat gets larger. When they hold one position a tiny area is covered. When cruising, a wider area is covered in the wing stroke: 90 degrees from top to bottom of the beat. The team’s study involved high-speed photography of bees flying in a confined area filled with oxygen and helium. The mix apparently made the bees work a bit harder allowing their wing strokes to be better examined. Some reports speak of a giant bee wing mock-up as well. I wish I could find photos of that. The 230 beats per second result of their study came as a bit of a surprise. Normally, the larger a winged animal is, the slower it beats its wings. We think of bees as small, but in the world of flying insects, they are relatively large. The tiny mosquito flaps at 400 beats a second. Fruit flies, are larger than mosquitoes but still less than half the size of a honey bee, beat their wings 200 times a second. So if one were to go by how beats per second relates to size, one might think that a bee, being even larger than fruit flies, should flap at less than 200 times a second. But once again, nature wins out over human logic. Bees use more energy to fly than mosquitoes, fruit flies, and other insects. However, researchers’ theorized that the bees’ wing beats and strokes evolved to let them lift and haul more weight in flight. All that nectar, pollen, sap, and pollen can get pretty heavy, and require flight muscles to do a lot of work. But bees do not fly by wing muscles alone. There’s a lot of wind out there, from strong head winds to pesky little gusts that can throw a worker off her path to a honey flow or a drone off his pursuit of a virgin queen. 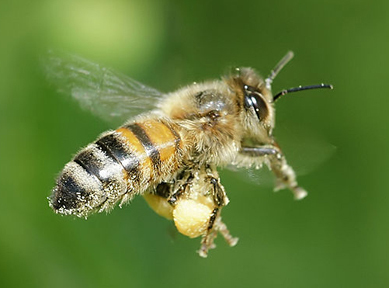 Bees’ eyes, antennae, and abdomens all play a roll in the flight of the honeybee. Over the years studies have shown that bees use their eyes and their “feeling” of the wind to help them fly. In 2013 a team the University of Queensland, Australia that included Gavin Taylor, Tien Luu, David Ball and Mandyam Srinivasan set out to examine how vision and “feel” affected what the researchers termed the “streamlining response” of the bees. How do the bees configure their bodies to help them get though all that wind, and what sensory signals do they use to get themselves into the best flight positions. Their paper is titled: Vision and air flow combine to streamline flying honeybees. The team tied honeybees in a chamber where the wind and the visual environment could be regulated. What they wanted to document was how the bees’ abdomen reacted to the perceived wind. A raised abdomen streamlines a bee’s body. A lowered abdomen creates more air resistance. Fast moving images, but no wind : bees’ abdomens went up. The bees would also raise or lower their abdomens when confronted with different types of airflows. A head wind is different from a tail wind. A strong wind gets a different response than a gentle breeze (abdomens up in a hard wind). This all gave a good indication that the bees needed both the visual cues and the “feeling” of the wind as well. But where was the “feeling” being felt? The researches focused on the bees’ antennae, specifically the Johnston’s organs in the antennae. Other insects are known to use these antennae organs to judge wind speed. When the bees’ antennae were immobilized, the bees in the wind chamber, did not lift their abdomens as much as they had before. The results showed that bees use both their eyes and their antennae to judge air currents and wind flows. They then adjust their abdomens to get the best flight. A bee’s flight looks so effortless, and yet it is full of energy: Flight muscles moving, Wings beating 230 times a second, wing arcs changing and rotating, eyes scanning, antennae “feeling” the wind, abdomen rising and falling on every change of breeze. It’s exhausting to think about. And they do it while hauling loads, chasing queens, and mating. The more I learn about bees, the more of a marvel they are to me. Please note: I’ve done my best to interpret the papers that I read about how bees fly. I’m no expert. If anyone has any corrections, addendums, or more insight into the amazing flight of honeybees, please write and share. The book I linked to earlier “The Biology of the Honey Bee” by Mark L. Winston, is one of the best books I’ve found on honey bee biology. Check it out of the library, and I bet you’ll wind up buying it for your own bee library. It’s well written and well researched – a fun read (which you can’t always say about biology books). That’s the news from Brookfield Farm Bees And Honey, Maple Falls, Washington. As I said, all the bees are in cluster as our temperatures keep dropping. I know some of you all are looking at the arrival of spring – yes, I’m somewhat envious, but there’s already great cross-country skiing just up the road, and I finally have time to return to the digital darkroom (pinhole wilderness images, nothing to do with beekeeping). There’s a season for everything.